But it’s the 21st century. Most of my traffic comes from modern browsers, and quite frankly, most of my users are fairly tech-savvy. I don’t want to slow everyone else down because somebody is chugging along on IE 4.0 on Windows 95. Google and Yahoo use gzip compression. A modern browser is needed to enjoy modern web content and modern web speed — so gzip encoding it is. Here’s how to set it up. Wait, wait, wait: Why are we doing this? 3. Server: Found it! Here’s your response code (200 OK) and I’m sending the file. 4. Browser: 100KB? Ouch… waiting, waiting… ok, it’s loaded. 1. Browser: Hey, can I GET index.html? I’ll take a compressed version if you’ve got it. 2. Server: Let me find the file… yep, it’s here. And you’ll take a compressed version? Awesome. 3. Server: Ok, I’ve found index.html (200 OK), am zipping it and sending it over. 4. Browser: Great! It’s only 10KB. I’ll unzip it and show the user. The “good news” is that we can’t control the browser. It either sends the Accept-encoding: gzip, deflate header or it doesn’t. Deflate is quick and works, so I use it; use mod_gzip if that floats your boat. In either case, Apache checks if the browser sent the “Accept-encoding” header and returns the compressed or regular version of the file. However, some older browsers may have trouble (more below) and there are special directives you can add to correct this. We check the “Accept-encoding” header and return a gzipped version of the file (otherwise the regular version). This is almost like building your own webserver (what fun!). But really, try to use Apache to compress your output if you can help it. You don’t want to monkey with your files. In your browser: Use Web Developer Toolbar > Information > View Document Size (like I did for Yahoo, above) to see whether the page is compressed. 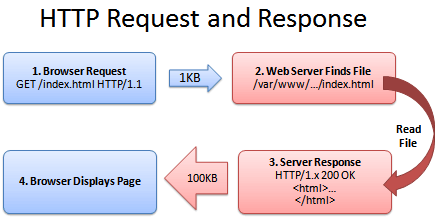 View the headers: Use Live HTTP Headers to examine the response. Look for a line that says “Content-encoding: gzip”. CPU-load: Compressing content on-the-fly uses CPU time and saves bandwidth. Usually this is a great tradeoff given the speed of compression. There are ways to pre-compress static content and send over the compressed versions. This requires more configuration; even if it’s not possible, compressing output may still be a net win. Using CPU cycles for a faster user experience is well worth it, given the short attention spans on the web.